Here at Unclutterer we espouse the clutter-free lifestyle. The reasons are mostly obvious: a clean, tidy home means less time is spent searching for things, knowing what you actually own, etc. In this post, I want to look at the less obvious benefits of uncluttering. These less obvious advantages are just as powerful as those listed above. Let’s get started with time. Time, not money, is the only valuable commodity we have. Would you rather lose ten dollars or ten years? Without time, nothing else has value, so the wise person treats it as precious. Finish small tasks right away. Schedule time to spend on big tasks and stick to it. Clean as you go. Adopt a calendar/planner that fits your lifestyle and use a productivity system you trust. You’ll spend less time on household chores, and more time with family and friends. Next, and this is a rather specific example but bear with me. Being uncluttered means that unexpected visitors do not elicit a stressful frenzy of straightening up. It might not happen often, but when that unannounced guest is en route to your door, a few minutes of tidying is all that is needed to make the house presentable. Compare that to the frenzy of straightening a cluttered house. “These are the years spent in the trenches. The years where my wife and I argue over who gets to be the one to grocery shop, because grocery shopping means you get 25 minutes to yourself. If guests arrive and there’s a stack of papers on a table somewhere or library books strewn about or if our dear visitors have to witness a round of my favorite 7:38 a.m. game, ‘Where Are Your Clean Socks And Why Must We Go Through This Every Blessed Day?’, Fine. It’s completely unreasonable, in my opinion, to live in a clutter-free home 24/7/365. That’s not what I’m proposing. Just make an effort to tidy as you go to save some stress. Next, your family will catch the uncluttering bug. I know, that sounds crazy. I have two teenagers whose favorite activities include sleeping, eating and playing video games. (Perhaps you’re familiar with this scenario.) If the house is routinely tidy, they won’t like it when it isn’t. In fact, they’ll start to organize to keep things on an even, tidy keel. I’ve seen it happen and it’s glorious. When the tidying starts to happen consistently, you’ll feel more creative. This one is backed by science. Researchers at the Princeton University Neuroscience Institute demonstrated that a cluttered environment restricts one’s ability to focus. Having trouble finishing that novel or getting some work done? A cluttered desk or office could be a contributing factor. Lastly, you’ll likely get more sleep. A sleep study conducted in 2015 showed that people who routinely sleep in cluttered rooms are more likely to have sleep disturbances and get less restful sleep than counterparts in tidy rooms. Who doesn’t want better sleep? I sure do. There you have a few less obvious benefits to pursuing the uncluttered lifestyle. If you’ve discovered any hidden benefits to being uncluttered, please share them with readers in the comments below. I find de-cluttering overwhelming – depressing, exhausting, paralyzing. So I tried a different method – I will give myself ONE week to do ONE thing. A few weeks ago it was cleaning and decluttering the bathroom. I would spend ten minutes clearing out a drawer full of unused makeup, and the next day half an hour scrubbing the shower, but it worked!! It was the only thing on my to-do list aside from the bare-bones basics, like cook dinner & feed the dogs. I can relate to Marta here. Uncluttering can be “depressing, exhausting and paralyzing,” especially if you’ve got a lot of other things to do, maintenance seems endless or you simply don’t know where to begin. I’ve been there myself and I suspect may other readers have, too. Marta’s solution is a good one: focus on one activity and do not let not doing the other activities elicit any guilt. It is a fine example of breaking a project down into smaller steps. You can’t “unclutter the house” on Sunday, but you probably can clean out a drawer or clear off a shelf. Reward the victories and build momentum for more. Start saying “no.” At least for the short term, you need to say “no” to as many new responsibilities as possible. Get it out of your head. The next thing you need to do is get everything out of your mind and onto a sheet of paper. Doesn’t need to get done right now/ever and I don’t really want to do it. Occasionally it’s easy to pinpoint the source of the overwhelming feelings. You might inherit clutter, or be dealing with children’s toys, which seem to be in all places at all times. The one that gets to me — and apparently troubles Marta as well — is an overwhelming to do list. I love making lists. It’s typically a calming exercise that helps me feel on top of what needs to be done. That is, until the list grows to a frightening size. That’s when it’s time to employ some strategy. Embrace some of the stress. It’s easy to feel overwhelmed when it comes to uncluttering. With a little preparation and planning, you can get back on track. It’s January, but here at Chez Dave we’re already thinking about storing the winter clothes (hats, gloves, etc. ), and tools (shovels, ice scrapers, etc.) and pulling out the spring items. It’s an unenviable task but one that can’t be avoided. It’s also a good time to take stock of what we own and identify what can stay and what should go. That process is made so much easier by asking one simple question: If I went shopping today, would I buy this? Before putting something into storage or taking it out, just pause. Hold an item up and honestly ask the question. If you were standing in a store with that item right now, would you pay full price to bring it home? If the answer is yes, then you’ve found a keeper. If not, then you have a reason to consider your relationship with that item. Is it actually something you want or need? You get the idea. If any items are non-functional, obsolete, rarely used, etc., put them aside and consider if they really have a place in your home. Good luck and happy purging. As for your feelings, do your best to stay positive. Identifying a good support team can help immensely. An action plan will work wonders and help decrease feelings of being overwhelmed. I recommend breaking things down into small steps. Here are some current examples of hardware and software to help you achieve each of those goals. Every January, millions of people vow to improve their health by either losing weight, adopting a healthier diet, or exercising regularly. For improving physical health I love Couch to 5K. 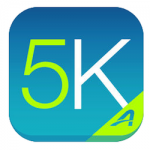 Available for both iOS and Android, this effective, great-looking app can get you running five kilometers in just nine weeks. As a former couch potato, I can confirm that it works. Who doesn’t want a few extra dollars? I won’t dive into organizing your finances in this article, but I will recommend Betterment for helping with long and short-term investments. Betterment was founded in 2008 and it’s a quite nice product. They have low fees, a great app and, in my experience, great advice that’s always available. This often gets overlooked, but it’s great for your community and sense of self-satisfaction. 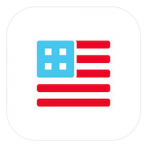 Countable keeps you up-to-date on what’s happening in U.S. politics, from bills to news from your local representatives. You can call your reps, share video messages with elected officials, read non-partisan news summaries, and prepare for upcoming votes. Kayak is still my favorite travel app. It is as close to a portable travel agent as you can get. It handles everything from finding a flight to hotels, car rentals, attractions, things to do, and much more. Kayak polls several top travel sites and airlines for flights that match your criteria. The results can be filtered by airline, number of stops, airport, price, and duration. 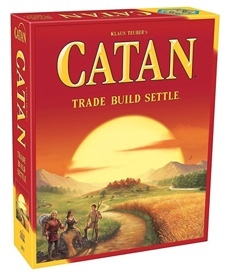 You can also sort by cost, duration, and departure time. The app is available for the iPhone, iPad, Android phones, Windows phone, and Kindle Fire. There you have it. I hope there’s something here to inspire you to an exciting, fulfilling year. Good luck! Last year we shared some advice on organizing a medicine chest. Now that cold and flu season is upon us, I want to revisit the topic with a few more best-practice tips and tricks. As Erin previously stated, don’t store medicine in the bathroom. Humidity isn’t good for many medicines and unlocked cabinets can be an invitation to curious kids (or nosy house guests). Instead, invest in a lockable cabinet that can be mounted in a closet or somewhere similar. You’ll find the rest of Erin’s great tips here. In this post, I’d like to offer some tips on how to organize the items within your medicine cabinet. 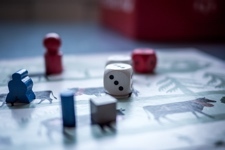 First, round up those little cylinders that love to fall over, roll around, and make a general nuisance of themselves. I’m talking about lip balm, sunscreen, and the like. 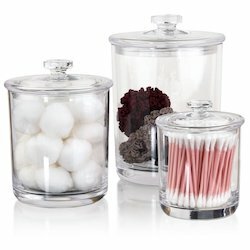 Clear acrylic canisters will keep them tidy and easily identified. Next, round up small metallic items like bobby pins and tweezers and stick them to a bit of adhesive magnetic strip. It will save you hours of hunting around trying to find them. Move “leftovers” into smaller containers. You don’t need to store the last four bandages in that gigantic cardboard box that is already falling apart! Move them into something like a zipper lock bag or coupon organizer. The same goes for cotton balls, cotton swabs, etc. If you keep cosmetics in the medicine chest, consider these stick-on mini-shelves for the inside of the door to keep them organized and separate from medication. Lastly, give the cabinet a good cleaning. Remove everything, wipe down the entire interior with sanitizing wipes, and properly dispose of anything that is expired or no longer needed. When that is done, re-arrange the contents based on how you live. Put oft-used items front and center while moving the stuff you rarely use on a top shelf. You’ll spend less time digging around. That way I don’t need to tear the medicine chest apart to find these things in an emergency or when I’m packing for a trip. Holiday gift bags are more popular now then when I was young, and unlike wrapping paper, they’re reusable. This year we received quite a few of them and I’ve been thinking about good ways to store them. 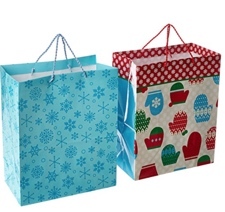 Here are a few ways to store holiday gift bags to keep them in good condition for reuse. Magazine holders are my favorite method of organizing gift bags. You can get about two dozen bags into a single magazine holder, and the write-on label makes it easy to categorize and retrieve the one you want. You can also use a large, handled gift bag and put the smaller gift bags inside. Once folded, sort them by size or occasion. The larger bag becomes a sort of mobile filing cabinet that you can pull out at the next gift-giving occasion. It’s easy to store, simply hang it on a hook in a closet. An expandable accordion-style file folder is another great method, provided that your bags are relatively small. Don’t expect larger bags to fit without protruding from the top of the folder. 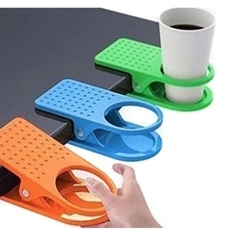 A hanging organizer might be useful. However if hung on a door, it may prevent it from opening all the way or bang against the door whenever it’s opened or closed. It would be great if hung on a rod in a closet though. If the bags are not suitable for re-use, you can cut them into gift tags, use them for arts-and-crafts projects, donate them to an elementary school teacher, after-school club, or toss them into the recycling bin. In any case, have fun organizing — or saying goodbye — your holiday gift bags.